The shoulder is the articulation that connects the arm to the thorax. It includes several bones such as the humerus, the clavicle and the scapula, which are attached by ligaments and moved by a group of muscles called the «rotator cuff». 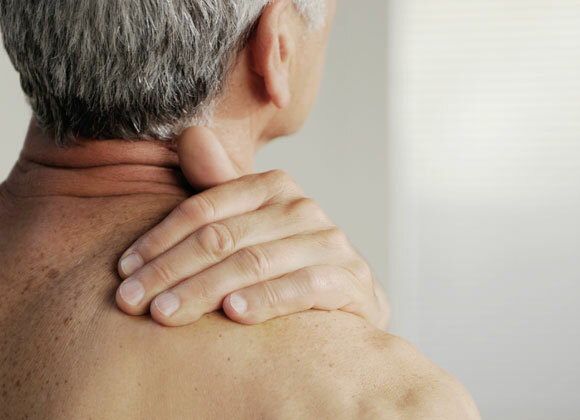 Shoulder pains are among the most frequent reasons for orthopedic consultation. The menu above will allow you to explore the treatments offered at the Clinique Chirurgicale de Laval for various shoulder aches. You experience pain while raising your arm in certain specific ways? In repetitive movements? During exertion? The pain is mainly located in the anterior and lateral side of the upper arm? You may already have signs of degeneration of the small tendons around the shoulder joint, also known as the rotator cuff. If there is only inflammation, we are faced by either rotator cuff tendinitis or subacromial bursitis. If the pain is persistent, the rotator cuff or the cuffs membrane covering the ball of the shoulder, may be showing signs of wear known as rotator cuff tear. The condition is aggravated by friction during arm movement of the cuff under the acromion, a bone linked to the shoulder blade and to the clavicle. This is what is know as subacromial impingement. When conservative treatment, including rest, anti-inflammatory drugs or steroid infiltrations proves unsuccessful, some candidates can benefit from arthroscopic acromioplasty or even cuff repair. In some instances, the pain is precisely on the tip of the clavicle, at the acromio-clavicular joint. This can be acromioclavicular synovitis or even acromioclavicular ostoarthritis or premature wear. If treatment using anti-inflammatory drugs or steroid infiltrations is unsuccessful, an acromioclavicular resection arthroplasty eliminates pain from the friction. The pain can originate from the attachment of the biceps inside the shoulder on the cartilaginous ring on the margin of the scapulas glenoid cavity,with a rupture or tear on the labrum (often called S.L.A.P). If the problem is persistent, labrum repair is possible and if there is further associated damage, the repositioning of the biceps using tenodesis can be warranted. When shoulder movement is severely limited, we must first check the sphericity of head of the humerus or the ball of the shoulder, and the integrity of the articular cartilage. Osteoarthritis or inflamatory arthritis may have destroyed the joint and can be the source of significant pain with any shoulder movement. If further examination reveals significant destruction, articular replacement or arthroplasty can provide lasting relief. If it is clear, after radiological evaluation, that loss of amplitude is not associated with degenerative change in the shoulder, the problem may be capsulitis which, in most cases, should evolve favourably without surgery. Following a trauma, you have the sensation that your shoulder pops out? That it tends to pop out in certain positions? Repetitive shoulder dislocation can be incapacitating. Once the damage has been properly evaluated, the situation can most often be addressed with surgery with a stabilizing shoulder technique, be it arthroscopic or open. If in the presence of shoulder separation with significant acromioclavicular dislocation, the deformation of the shoulder can be a nuisance. If there is significant deformation, acromioclavicular repair can restore anatomical integrity of the joint.